Last Updated: July 6, 2013 | Subscribe to our weekly newsletter! Every year there are a few people who ask me, “how to keep ducks out of my pool?” It’s hilarious to think that ducks are using your pool — perhaps they’re sipping drinks on your floating pool lounger or playing Marco Polo. Either way, they need to go! 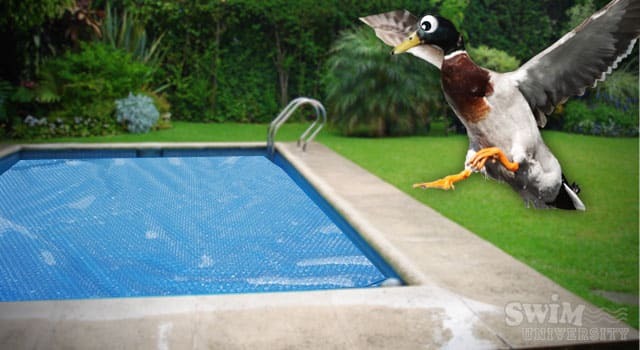 Here are 5 tricks for keeping ducks (and other birds) out of your swimming pool all season. 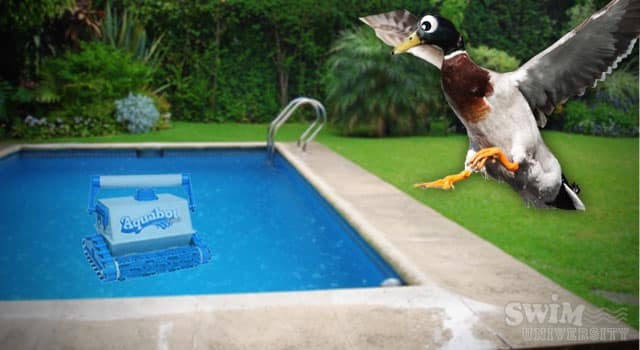 Solar covers not only keep your pool heated and free of debris, but they also keep ducks from swimming and pooping in your water (or can at least keep the poop from fully mixing in). Ducks are easily frightened creatures. They fear predators, and nothing looks more like a predator than a moving, underwater automatic pool cleaner. 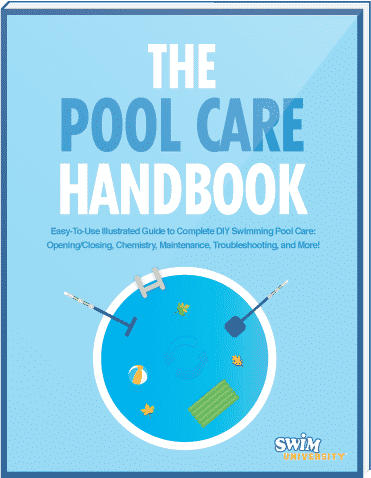 Again, if you already have an automatic pool cleaner (and you should), good for you! If not, I invite you to check out the best robotic pool cleaners on the market (and here are some for above ground pools too). Ducks hate dogs and vice versa. Dogs are one of the duck’s natural predators, and their bark alone will scare them away. This is more of a reactive method than a prevention method, but it does the trick. Hopefully your dog(s) can see the ducks in order to bark from inside the house. 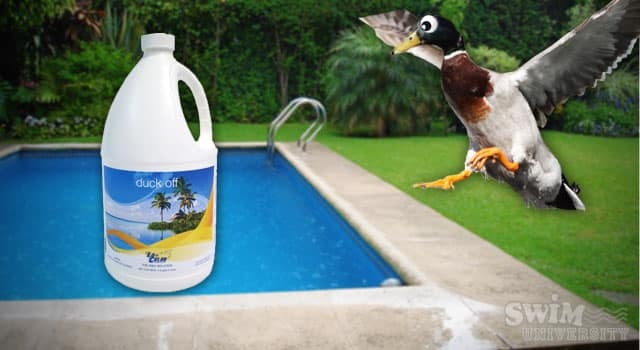 The Lo-Chlor company makes a pool chemical called Duck Off that breaks the surface tension of the water. This chemical makes it so the ducks cannot successfully float on the surface. However, I don’t like the idea putting unnecessary chemicals in the pool. So my recommendation is to use this option as a last resort. Take a bowl of water and sprinkle a bunch of cracked pepper on the surface. Then, lather up your index finger with dish soap and submerge it in the center of the bowl. What you’ll see is the pepper magically race to the edge of the bowl, like roaches scattering when the lights come on. It’s a cool trick and does well at parties to impress new friends — I should know because I did this trick a few months ago at a party. 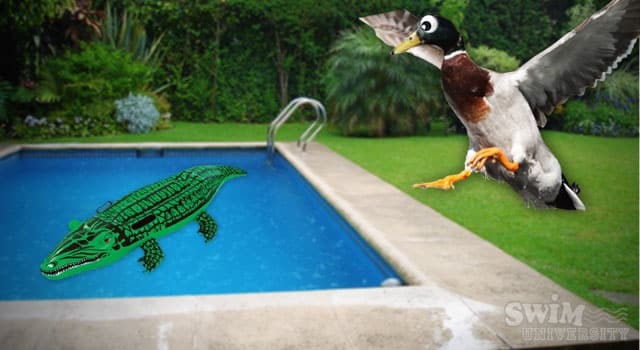 If you have ducks in your pool, I hope one these tricks will work for you.